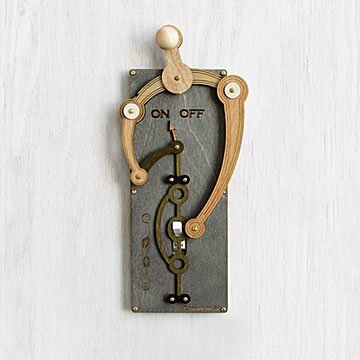 Evoke the Victorian spirit with the steampunk style of this laser-cut, mechanical light switch. These mechanical light switches transform an ordinary appliance into the perfect flourish for your secret library, steampunk chalet, or wherever your imagination lives! The fabulous contraptions are the brainchild of Lance Nybye Jr.. He crafts the mechanisms from decorative plywood, often leaving the alternating colors of wood left exposed at the edges. The joints are all finished with brass hardware, and the laser engraved details have the swirling ornamental lines of a Victorian engraving. The switch installs easily in your bedroom, hobby room or office. Simply attach it over an existing, standard switch plate using the existing screws. Made in San Diego, California. Click here to check out our Frankenstein Switch Plate . Clean with a dry towel; do not wet. This is a very fun and attractive addition to our lake house. We haven't installed it yet since the house is not nearby, but it seems like it will be easy to do. It's much lighter weight than I anticipated, so I hope it will hold up over time. We will probably place it at a "low traffic" light switch. I am excited about placing it there though and believe it will add nicely to the vintage decor there. Such a cool product. Looks great next to our techno gizmo wall decal. Only complaint and it is minor is that the holes where the screws go had some wood chipping shavings already prior to install so it does look a bit shobby in those spots but nobody notices. Looks great, works well but we had to purchase longer screws in order to install it. This was such a fun gift to give to my DIYer son. He appreciated the craftsmanship and the style. My son, the architect, loved this! Very ingenious design. I wish it wer more substantial feeling. I feel like it's going to break further with actual use. These switch plates are very fun conversation pieces. Looks great and works great. The only draw back is we had to move the electric! It is larger and our light switch was close to the door frame so it didn't operate. Pay attention to that when ordering. Well worth the headache though because it completes the room nicely.